Warrior Sailing Outreach Network managed by Ian Holtzworth has a growing array of sailing activities for Warrior Sailors. Here are some happenings around the network. St. Petersburg Adaptive Sailing Expo– St. Petersburg Sailing Center is hosting their semi-annual Adaptive Sailing Expo on September 8th, from 10:00am – 2:00pm. This event is a partnership between the St. Petersburg Yacht Club and the City of St. Petersburg’s Therapeutic Recreation Department, and is designed to give people with various physical and developmental disabilities the chance to experience these lifestyle watersports in a safe and controlled environment. This event would not be possible without the support of dedicated volunteers, therefore we are reaching out to see if you would be available to assist with the event from 9am – 3pm. We are looking for volunteers to help with various time slots and are always in need of qualified skippers to sail our Ideals and Sonars, as well as help checking people in, giving out lifejackets, operating a safety boat, etc. If you are interested in volunteering for the event or know anyone who may be able to assist, please let Corey Hall know. Performance Trimaran Sailing in Maryland- Charles Rush (USNR retired), a new supporter of the program would like to offer sailing opportunities on his Corsair F-28R trimaran. The boat is on the Magothy River located between Baltimore and Annapolis, just north of the Chesapeake Bay Bridge. Corsair trimarans are well known for their speed, and simple sailing systems, though they can be a bit wet and the accommodations are spartan. Please email him directly at chuck@rndwhip.com if your interested in a daysail, racing or working up to longer events. 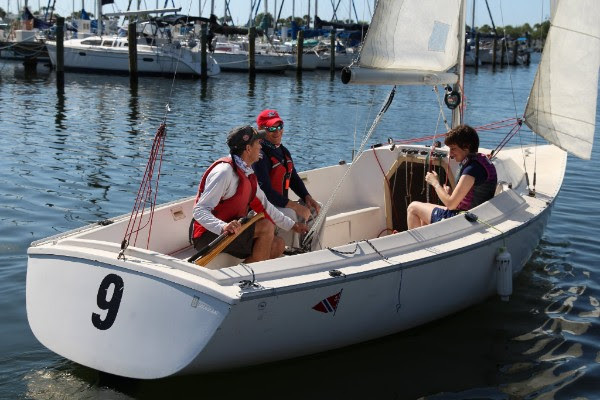 Operation Restoring Body, Mind, and Sail – Justin Thompson recently moved home to Michigan to be closer to family and got a 1984 Hunter 22 for free from an old Eagle Scout that used it to teach sailing to scouts. It had been in his brothers barn for 12 years, and then his back yard for a couple before Justin got his hands on it. All the bones are in good shape, but a lot of work to come. Justin is starting a Youtube channel called Restoring Mind, Body, and Sail if anyone is interested. He can’t wait to participate with Great Lakes Warrior Sailing when the boats ready. She will be renamed the SV Flighty Drifter.